Whatever type of tape or label you make we can recommend the best core for your product. If we need to design a custom core, we use your specifications to formulate proprietary adhesives and select the best paper. During manufacturing, we use cutting-edge technology to repeatedly test our cores for dimensional consistency and wall strength. And we can print your company’s name and logo on your core. 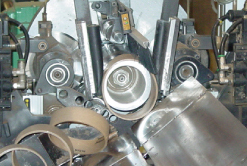 Midwest Specialty Products has specialized in the manufacturing of paper cores for the tape and label industries. We are known in the label industry for our consistent quality and solution providing abilities.